Hello! We are Jerry & Cynthia. God has given us powerful testimonies that we want to share with others so that they can know how amazing God has been in our lives, and how God can be just as wonderful in their lives. It has been laid upon our hearts to go out and spread the Word of Jesus Christ in a special way. You see, there are millions of individuals and families who live in or near RV Parks and campgrounds across America. Many are lost and do not know Christ; They may not attend church regularly or they simply lack Christian fellowship opportunities. It is our goal to reach out to the RV Parks, campgrounds and surrounding communities and provide casual worship and Bible study opportunities, good Christian fellowship, free Bibles and other bible study materials to all who will accept it, as well as giving our testimony and leading others to Christ. We always encourage those we meet to seek out a local, Bible believing church that they can attend regularly. 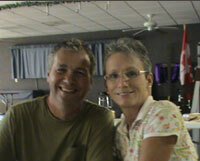 In 2012 we had a run-in with cancer and needed to sell the motorhome and deal with those health issues. We only found out about Jerry's cancer when he was hit by a truck while riding his 200cc scooter, and the ER spotted the cancer! The Lord has led us through that battle and we are back out there, just on a part time basis now. We have a new wheelchair van that we converted into a camper. We don't live in the van year round as we did before, but we travel in it during the warmer months (roughly April through September). We will use it locally during the colder months. It is our privilege to share God's plan with all that will listen. It is our duty to be open to the calling of God as he leads and directs us. It is our honor to give the glory to God for all things accomplished.